Nebraska has historically underutilized solar panel energy, considering the high (over 5 hours per day) daily hours of sunlight. 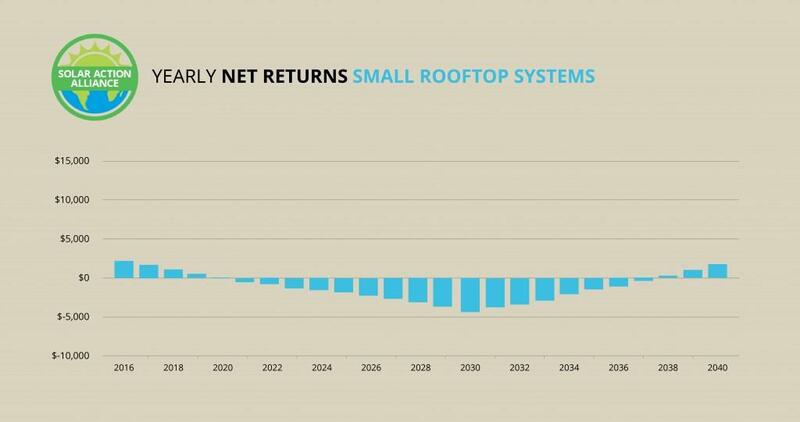 As the below Swanson chart shows, the costs of solar have dropped dramatically to a point where solar is a smart energy choice for Nebraska. 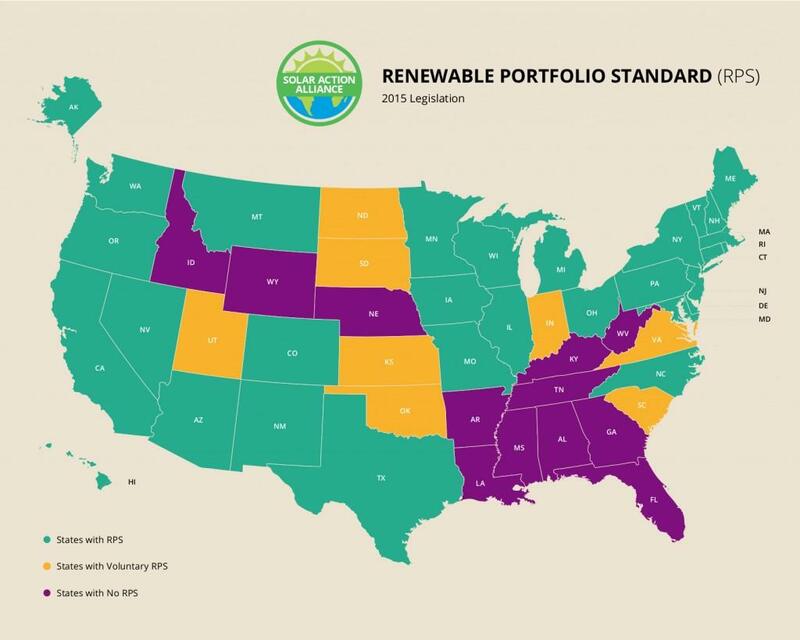 Nebraska has been struggling with solar issues for years, even though it is basically a progressive state and many residents have been asking for a modern renewables program in the state. With solar being beneficial to all involved, it is surprising that Nebraska has not done more to encourage home installation and common-sense rules and incentives to drive participation. Even with the lack of state incentives, all Nebraska residents qualify for the Federal Tax Credit of 30%, making solar a smart choice for Nebraska homeowners. Let’s take a look at the different solar panel options available to Nebraska residents. 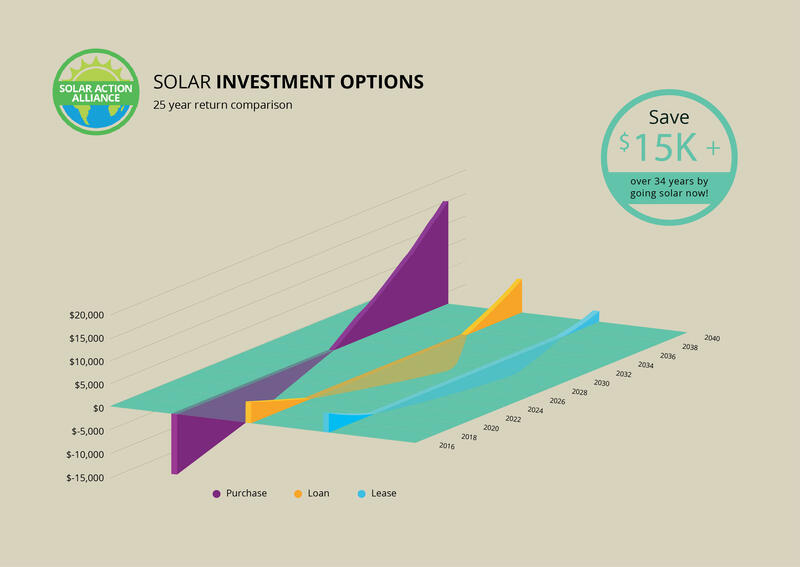 The chart below gives you an idea of the costs and returns for each solar option available to Nebraska residents – purchase, purchase with credit, and small solar. Sadly, since there is no RPS in place, there is no solar panel lease program available in Nebraska at this time. Assuming you have the cash available, paying for your solar energy system up front will always maximize the value of the system and the returns you realize. With no monthly payments, you immediately start getting 100% of the cost savings, along with the 30% Federal tax credit. Considering an average installation price of $20,000 for a 5kW system, you will see an immediate return of $6750 (Federal rebate) and an estimated first-year savings of around $751 in energy costs. 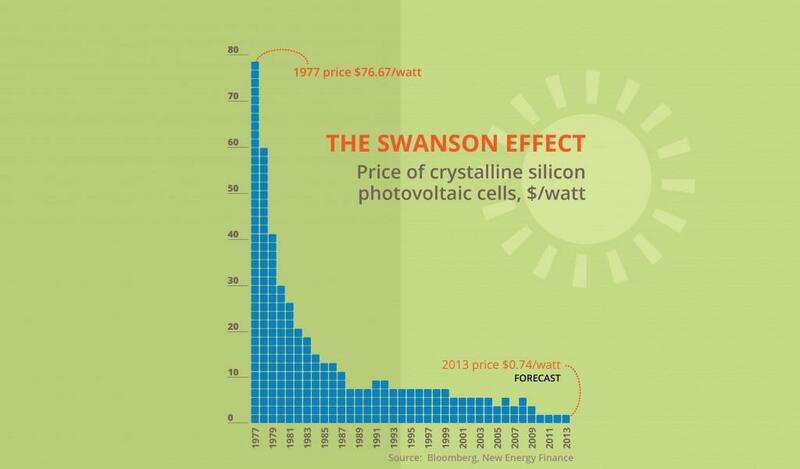 Taking into account expected energy price inflation, your yearly savings should be an estimated $1200 within 15 years. This should completely pay for the system within 14 years, but you still own the added value of the solar panel system to your property, and you are doing your part to save the planet. 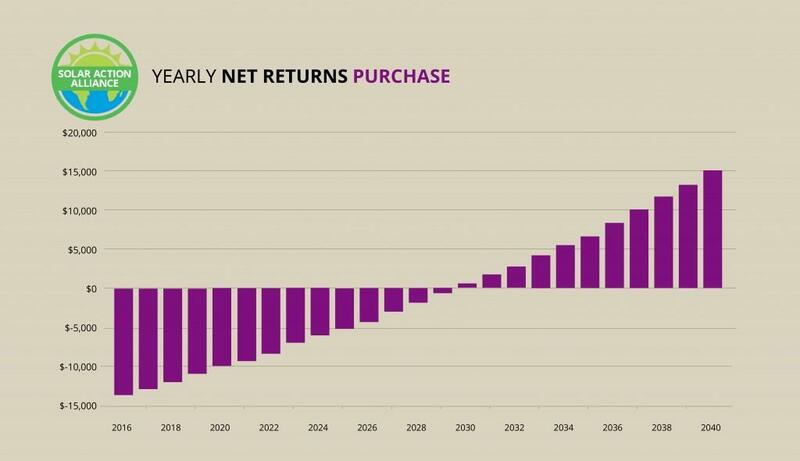 After 25 years, you should see a total return of $15,760, or around a 6.2% return. Not too bad! Remember, you are supporting local jobs and the environment too! Let’s assume a home equity loan of 5% for a $20,000 system for solar panels. While there will be a few years in the beginning where the loan payments are greater than the savings in energy costs, energy inflation will quickly outpace your loan payment. With an average $20,000 installation price, a purchase on credit makes perfect financial sense. Year one, you should have about $751 in energy costs, and have loan payments totaling about $1898. This means around $96 per month out of pocket your first year, but remember, you got $6000 in tax credits. That tax credit means you are $4860 ahead the first year! 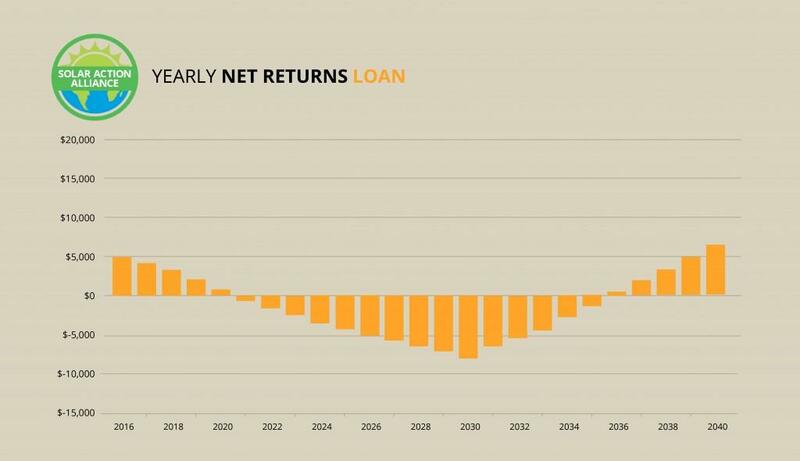 By year 15, when the loan is paid off, you will be realizing about $1250 per year in savings, and by year 25 your total net returns are around $6800, even after paying off the solar panel system! Even if you do not have the resources to pay cash for a system, or you don’t have the home equity to borrow $20,000 for a full 5 kW system, you can still benefit from solar! All of the numbers are similar to the example listed above, but around half the cost and half the savings. You can buy a small rooftop solar system (2kW) for around $9000, and still receive the Federal tax credits and home interest deduction, as well as the energy savings, just on a smaller scale. Your first year, you should have an estimated energy savings of around $300. With loan payments of around $850, your money out of pocket is about $46 per month – but remember, you get the $2700 tax credit, and any credit you do not use this year will carry over to next year! After year 15, you should see around $500 per year in savings, while doing your part to conserve energy and resources, and your property values have increased around $6000. Nebraska, sadly, is one of the few states to have no RPS. What this means for Nebraska is that there is no incentive for power companies to convert from dirty power to clean solar and other renewable. Nebraska has no “solar carve-out’. A solar carve-out is a guarantee that at least some portion of the energy generated will come from solar. With an RPS in place, there is no mechanism to enforce or plan a solar carve-out. Energy is cheap in Nebraska. Cheap energy prices means that it is less cost-effective here to convert to renewables, especially without state incentives and a strong RPS. Nebraska has no “interconnection” rules, governing how home systems hook up to the power grid. A lack of interconnection rules greatly increases the cost of plugging in and sending power back to utilities. Solar performance payments, or rewards for production of solar power, are almost nonexistent in Nebraska. Nebraska has no property tax exemption for the value of home solar systems. You are taxed for the increased property value of adding solar to your home. Not exempting solar discourages participation. 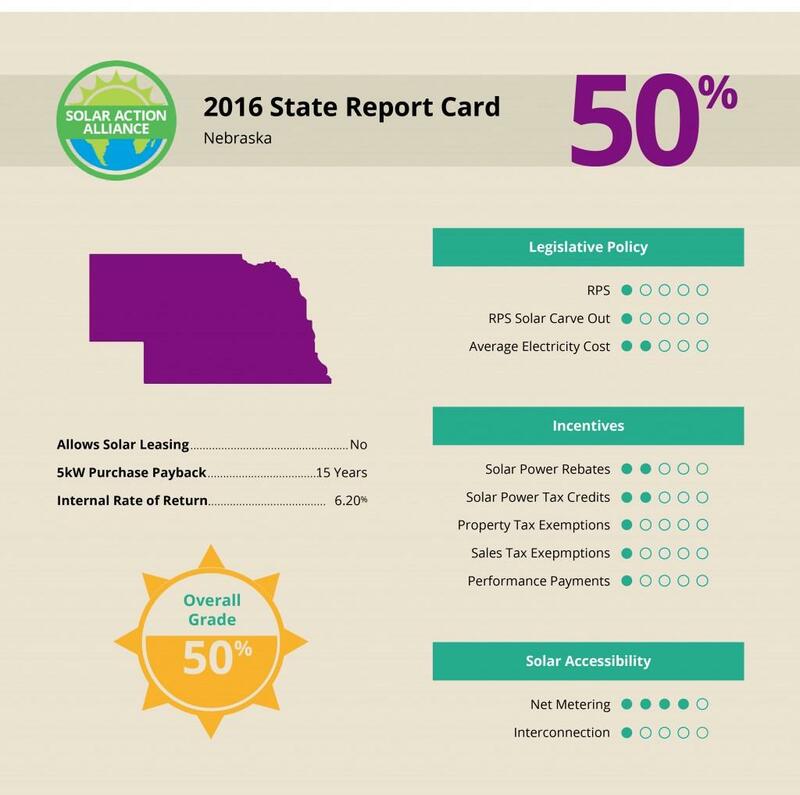 Nebraska has no sales tax exemption for solar. Many states exempt home solar from state sales tax, further reducing the actual cost of the system. Nebraska charges state tax on solar. This is a very easy, inexpensive change that would greatly increase participation. Net metering is statewide. Net metering means that any power you produce but don’t use can be sold back to the utility company for the same price they sell it to you. Some of the smaller energy utilities, like Lincoln Electric, are not waiting on the state to act, and are offering rebates on qualifying solar panel systems. There are some current state solar tax credits, but they are so small as to be meaningless. Hopefully, this is just a start to a more robust policy.